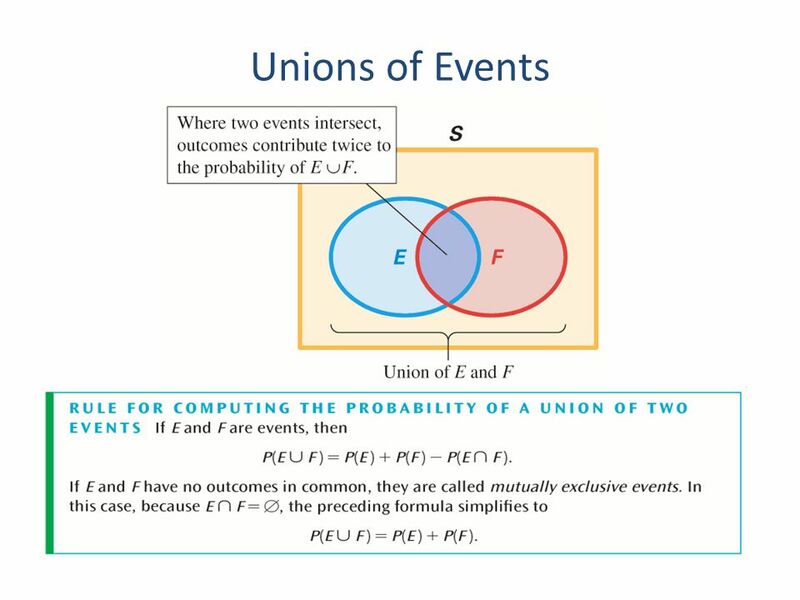 Section 2 Complements and Unions of Events Objectives: Understand the relationship between the probability of an event and the probability of its complement. 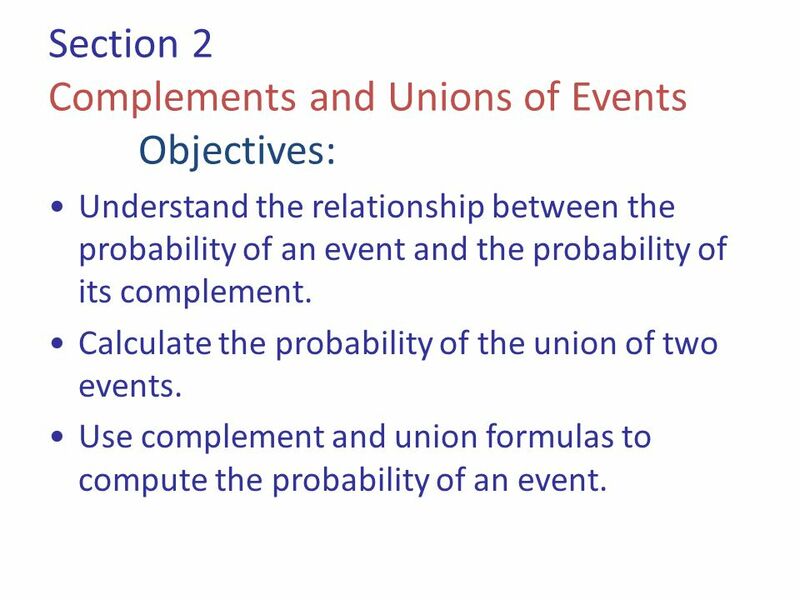 1 Section 2 Complements and Unions of Events Objectives: Understand the relationship between the probability of an event and the probability of its complement. Calculate the probability of the union of two events. 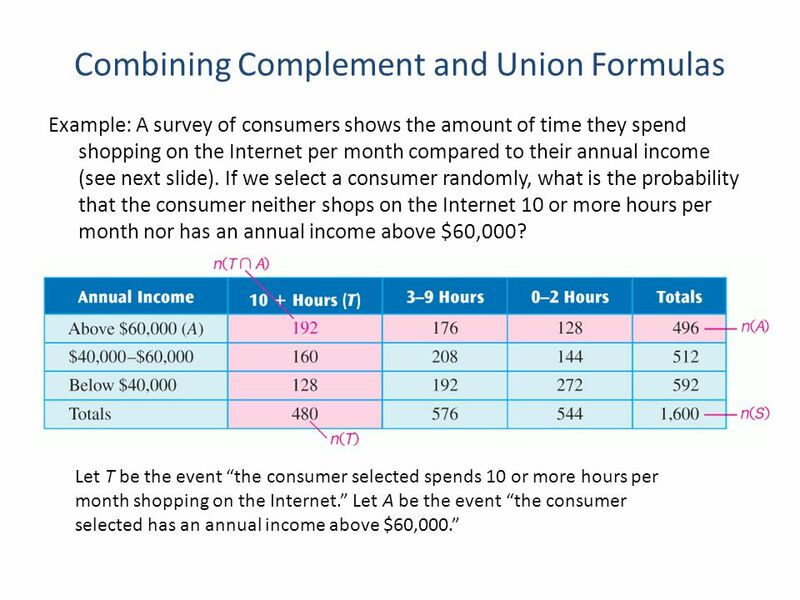 Use complement and union formulas to compute the probability of an event. 3 Complements of Events (2) Example: The graph shows the party affiliation of a group of voters. 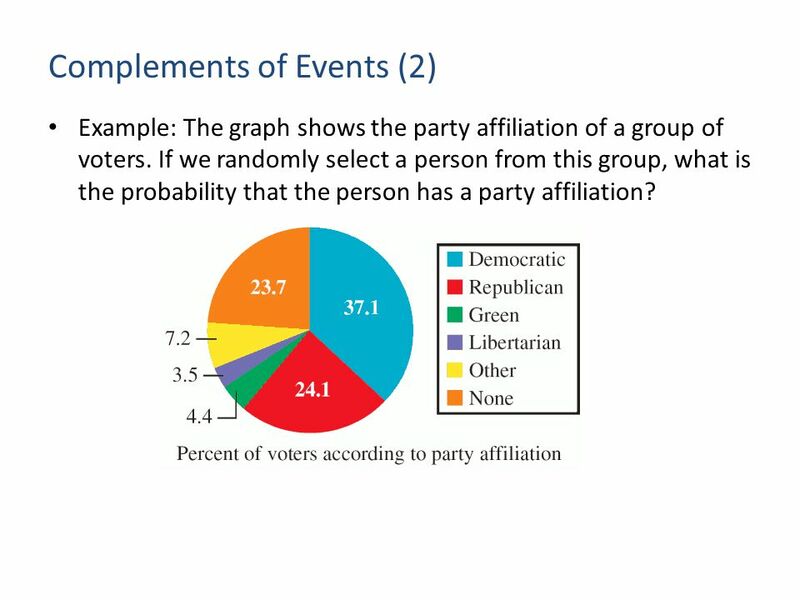 If we randomly select a person from this group, what is the probability that the person has a party affiliation? 4 Complements of Events (3) Solution: Let A be the event that the person we select has some party affiliation. 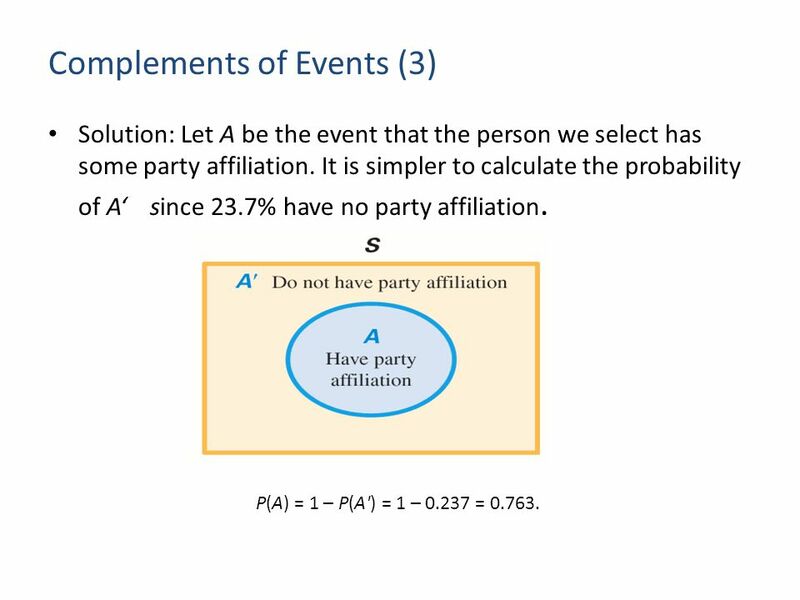 It is simpler to calculate the probability of A‘ since 23.7% have no party affiliation. P(A) = 1 – P(A') = 1 – 0.237 = 0.763. 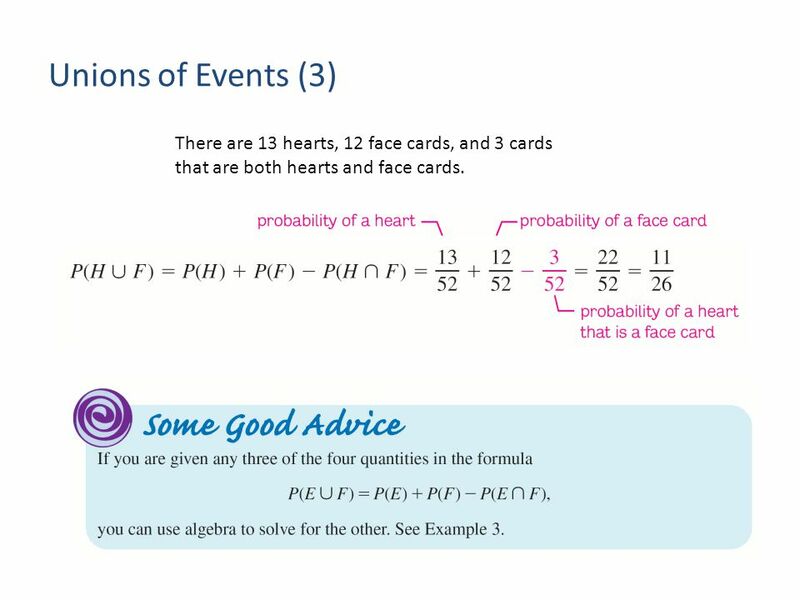 6 Unions of Events (2) Example: If we select a single card from a standard 52-card deck, what is the probability that we draw either a heart or a face card? 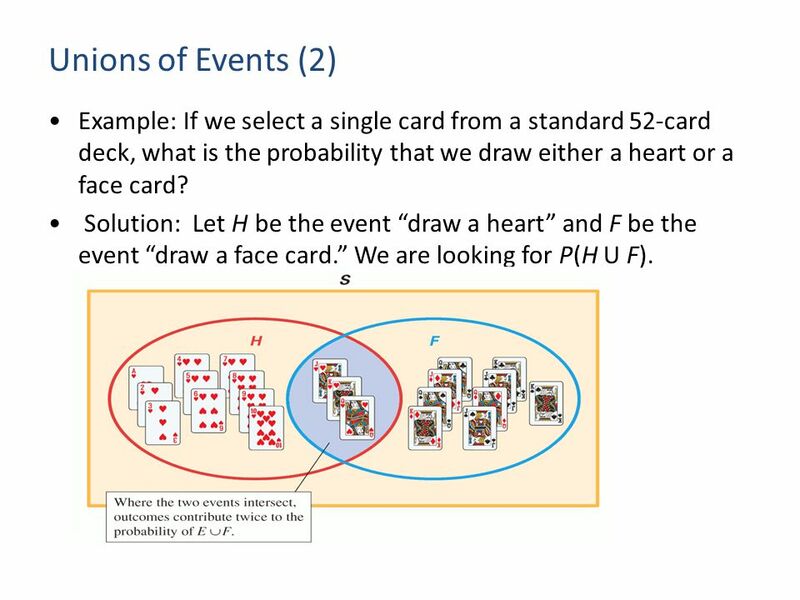 Solution: Let H be the event “draw a heart” and F be the event “draw a face card.” We are looking for P(H U F). 7 Unions of Events (3) There are 13 hearts, 12 face cards, and 3 cards that are both hearts and face cards. 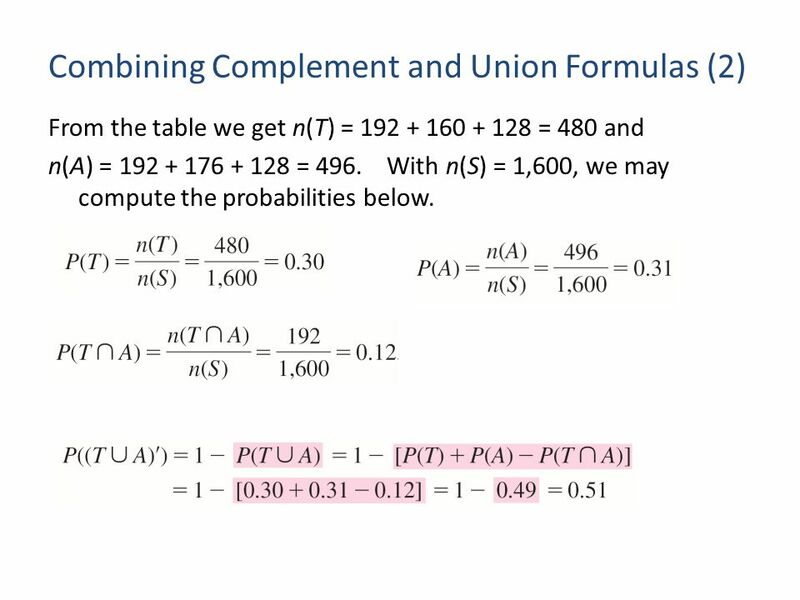 10 Combining Complement and Union Formulas (2) From the table we get n(T) = 192 + 160 + 128 = 480 and n(A) = 192 + 176 + 128 = 496. 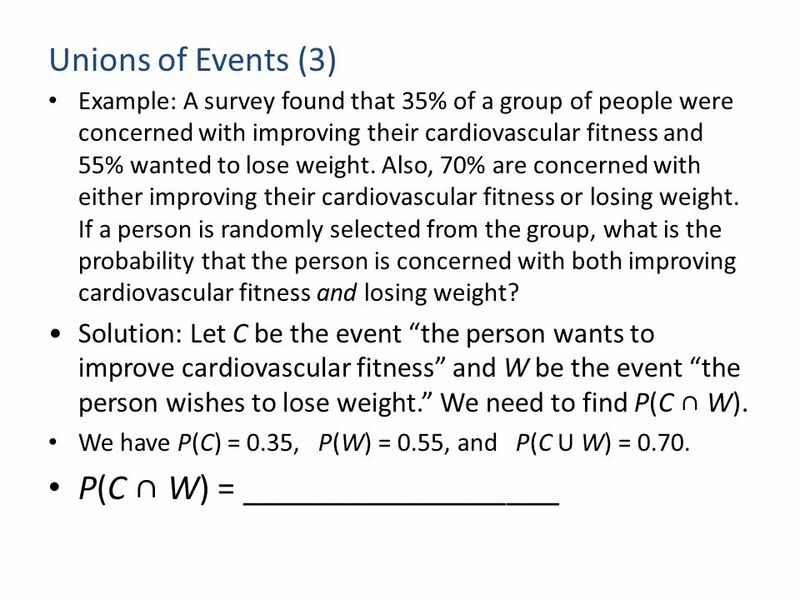 With n(S) = 1,600, we may compute the probabilities below. 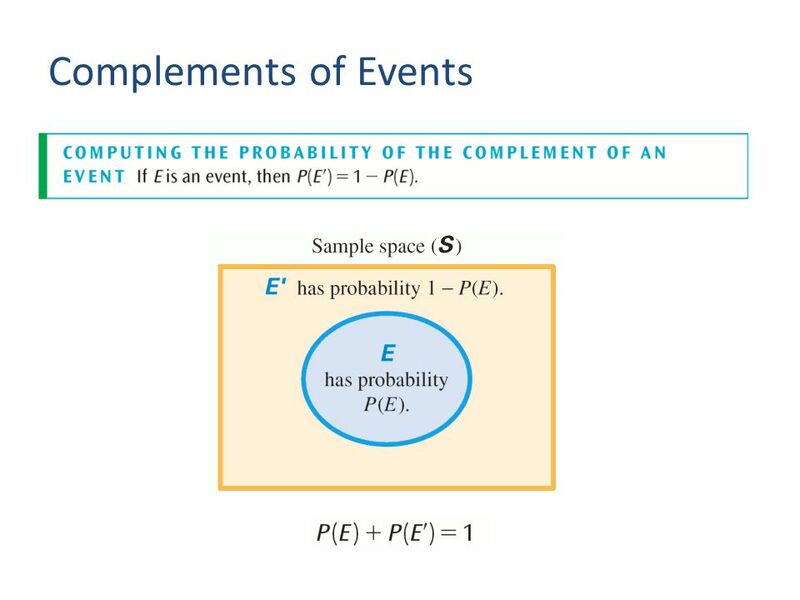 Download ppt "Section 2 Complements and Unions of Events Objectives: Understand the relationship between the probability of an event and the probability of its complement." Chapter 1 Applications and More Algebra. Math 7 Unit 6 Test Review. Chapter 4: Section 6 Compound Probability. Exemplar Question One The weight of individual guavas is normally distributed with a mean of 215 g with a standard deviation of 13.2 g. A. Chapter 1 Why Study Statistics? What are the odds?. To find the probability that a man has both a beard and a mustache would you multiply the probability of a man having a beard by the. Section 6.3 Compound Interest and Continuous Growth.